Every Saturday since mid-May, eco-savvy neighbors have been making pilgrimages to the Glover Park-Burleith farmers market with offerings of carrot tops, tea bags, egg shells, and other food scraps. Accepting their gifts are employees of Compost Cab, the DC-based organization that manages the DC Department of Public Works’s Food Waste Drop-Off program. Launched this year as part of a five-year trial to reduce the amount of food waste going to landfills, the service provides eight drop-off points, one in each ward. (See the DPW website for locations.) So far, a total of more than 1,000 pounds has been collected each Saturday from the eight sites. drop-offs have increased over the summer, says Fred, with watermelon rinds and corn cobs making the collection bins heavier than ever. Unlike some home composting set ups, the volume of material collected at community sites provides a critical mass that generates temperatures of up to 160 degrees, which allows thermophilic (heat loving) bacteria to do their thing. Fred encourages donators to chop food into smaller pieces, which helps food break down more quickly. if you buy corn at the market, husk it in a drop-off bin before taking it home. ideally, corn cobs should be broken in two or three pieces to speed composting. When the Glover Park-Burleith farmers market closes for the season in mid-November, residents may transport their compostables to Eastern Market (Ward 6) or to FreshFarm’s Dupont Circle Farmers Market, where Compost Cab has operated an independent food scraps drop-off point on Sunday mornings since 2011. 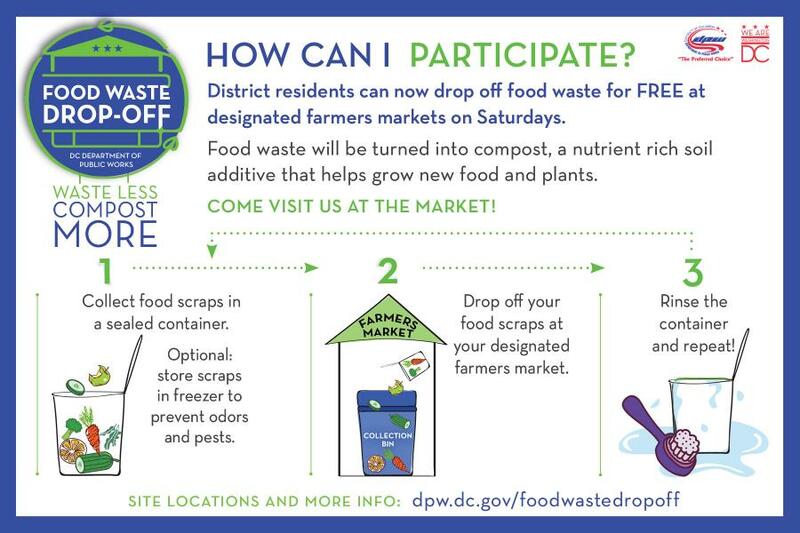 Residents can also sign up for a commercial service, such as Compost Cab or Compost Crew (a Glover Park-Burleith farmers market exhibitor), which picks up food waste weekly in company-provided bins. Frederick Struse at his command post at the car entrance to the glover park-burleith farmers market at hardy MS.